We started on a Thursday. I wanted to get a few days under my belt before the weekend. Finding a block of days where we didn’t need to leave the house and could simply focus on potty training is tough, but I felt it was important to work with her one on one to get this potty thing down. I’ve heard this can be one of the most stressful times of parenting, but going in I didn’t feel the anxiety that I expected. I figured at the end of the day she would either get it or she wouldn’t . I’m not going to go crazy and insist she learns, I want this to be a positive experience for her (and me!). I figured It was my job to work with her on understanding and encouraging her, but I wasn’t going to force anything if she wasn’t ready. This mentality went against most of the books and articles I read about a “no turning back attitude”, but I’m not a potty training expert – I’m only 1 week in, so who knows! She started showing interest awhile ago. She has always wanted to go to the potty with me throughout the day, and asks to sit on the potty after I’m done. She pretends to wipe and flush and then wash her hands, mimicking what I do. She would be playing with her dolls and point at their diapers and scream poop while rushing them to her small potty and waiting for them to go potty. She’s vocal about when she pees or poops and usually wants her diaper changed sooner than later. I read through the readiness signs I found on the internet, she didn’t have all of them, but in my mom-gut I felt she was ready so we thought why not try! 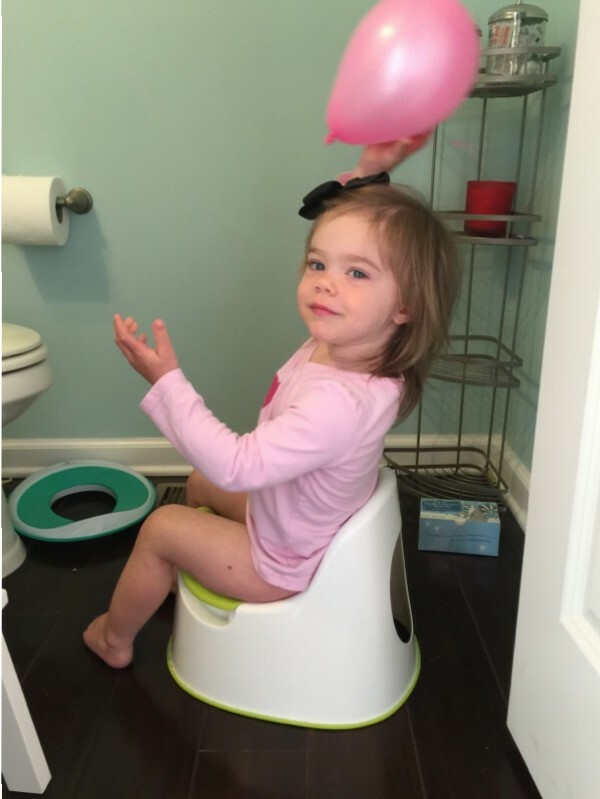 Thursday we threw a potty party – with balloons and all. Every kid is different and they will potty train when they are ready. Some kids respond to rewards, some to treats and some to praise. Find what your kid likes and do that. Watch for the ready signs. Some kids are ready at 20 months, some kids are ready at 3. Don’t stress out about it, because you will stress your kid out about it and then they will have bathroom issues. We all want to avoid those. Watch out for public loud automatic flushing toilets they will terrify your kid if they go off and think they are getting sucked in. Some people potty train in a day, others take months. Some swear off pampers or diapers and go cold turkey, others diaper for a year after potty training. Do what is right for you and your lifestyle. Rarely kids go to kindergarten in diapers – your kid will be just fine. No matter your choice – you are a good mom. So while I appreciated the motivation I realized while reading these potty training how to’s that every situation is different and thinking there is a perfect plan on how to potty train is a myth. What did help me was reading other’s experiences with potty training. Seeing how other kids reacted and what parents went through helped me prepare for the “anything may happen” mentality. It mainly gave me mom courage that told me other moms made it through this… so could I. So I was ready – Let’s do this! 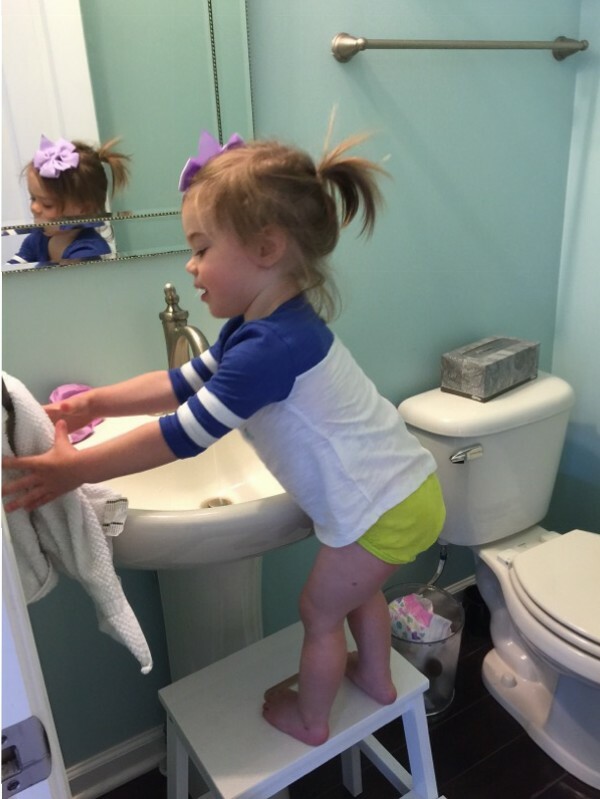 Stand alone kid potty – We bought this months ago from Ikea and started by putting her on the potty before bath time. Over the last few months she usually pees on the potty before bath while she is waiting for the water to fill up. Toilet insert on potty – Since I don’t want a big potty on my bathroom floor downstairs I bought this for our guest bath on the main floor. Also, I want her to be comfortable on both, so when we are out at stores she is able to use the potty there too. Stickers – She loves stickers – I probably could by-pass the food reward and just give her stickers. She is so proud when she puts her sticker on her sticker chart. Sticker Potty Chart – I am not an artist as you can see in my potty chart I drew for Lottie. Toddlers don’t care if you put money into a potty chart or they are simply adding a sticker to a blank sheet of paper. I say keep it simple. Yogurt covered pretzels – If I did this again, I would pick a different treat. Maybe fruit snacks? These were a lot of treat for every time she peed, but at the time in the Grocery store they looked like a good idea. Big girl underwear – I bought 2 packs of 6, planning to do laundry pretty much daily. The first day we went through a handful of them, but by day 3 she was wearing the same underwear all day. After a week of no accidents I took her out and let her pick out her own big girl underwear as a special prize. 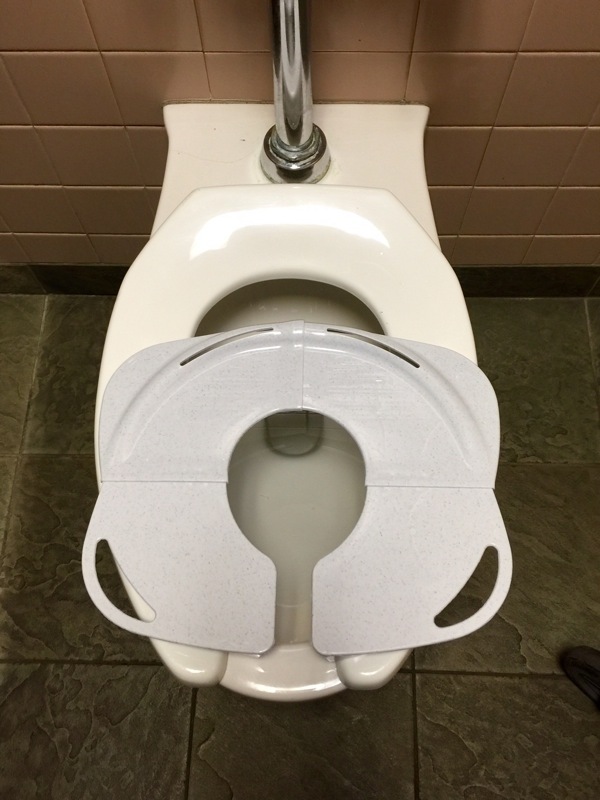 Folding Travel Potty – I wanted something that I could bring out with me and help her sit on a big potty and feel more comfortable, instead of me helping her hover over the toilet and pee. I honestly think this is the best supply I bought. It folds up small and fits in my diaper bag and when we finally got the courage to put her in the car and leave the house on day 4 she used the potty at Costco no problem for the first time. Over the last week we have used this travel potty multiple times and I think it makes leaving the house less stressful knowing that she will be able to happily sit on any potty we encounter without fear of falling in. We ran around pants free, with big girl undies all day for easy access to the potty. Some people say go completely naked all day, I’ve heard some kids become trained naked but once they put pants or underwear on they get confused. I decided to let her get used to wearing underwear and knowing she still needed to use the potty, so I planned to do a lot of laundry. 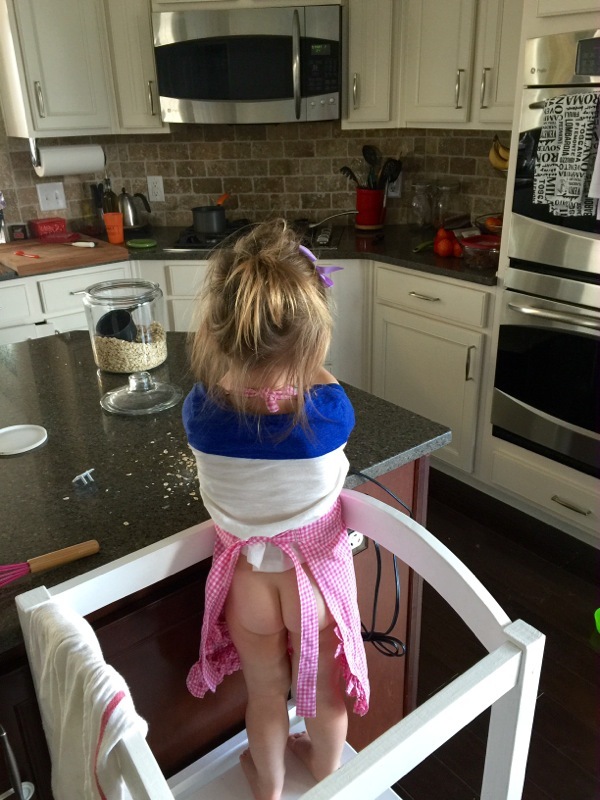 Also over these first few days we taught her to do simple things like pull her pants down herself by getting her thumbs in and pulling down. This was one of the readiness signs I read about, and a week ago she wasn’t doing it on her own, but now she is. Kids learn fast. Thursday we hit 50% for accidents, which I was pretty pleased with for day 1! We started out the morning with peeing on the floor twice. Luckily we had pulled up our rugs in the playroom so the hardwood was fair game. When she started to pee I would pick her up and run her to the potty where she would finish on the potty. I made sure to not overreact or act like she was doing something wrong. I praised her for peeing and reminded her over and over again that pee goes in the potty. Thursday morning most of the pee ended up on the floor. By the afternoon she started to understand that pee goes in the potty (after hearing me repeat that 100 times), and while she wasn’t letting me know when she needed to pee, if I kept her on schedule every 30 – 40 minutes she was good. We stayed close to the bathroom on day 1. We did some cooking in the kitchen together, watched her favorite TV shows and colored a lot. We made it a fun day for her and made every potty trip a party. No seriously we had balloons in the bathroom and would blow a new one up every time she peed. I wanted her to want to go to the potty and her to have a good experience, especially on the first day. By lunch we hadn’t seen a poop yet and she got quiet which is never a good sign. Josh came out from his office and caught her starting to poop while I was cooking and got her to the toilet ASAP where she was able to finish the second half of the poop. When they get quiet is when you need to be careful. We continued on the 30 minute schedule the rest of the day and didn’t have any more accidents after the first two, mainly because we visited the potty often. I kept a bowl of her favorite salty snacks, pretzels and goldfish nearby, along with a big water bottle to encourage her to drink as much as possible so we would have plenty of times to practice on the potty. We did still diaper her during nap time and overnight. I can’t even make it overnight without peeing twice, so I’m not going to expect baby girl to make it 12 hours on day 1. The most difficult part of Friday was entertaining a toddler in one room. I tried to keep her in our playroom in order to keep the cleaning to a minimum and being that it is the closest room to the bathroom. I was so worried about her peeing all over my floor, and shocked that we had no major accidents on day 2! Twice she started to pee a very small amount, but today, unlike yesterday, she was able to stop herself and wait until I helped her get to the potty to finish the remaining 90% on the potty. I extended the potty timer to 45 minutes so we weren’t visiting it as often. I was surprised with her ability to hold it until we got to the potty. She told me twice that she has to go to the potty, the other 9 times were me making sure we sat on the potty every 45 minutes. Small victories, we were making progress. During the day we continued loading up on pretzels, grapes and juice (that I watered down) to get as many liquids in her as possible. Today we ventured out into the Garage to play. It’s March, so the weather is still in the 40’s, a little too cold to play outside for a lengthy amount of time with no pants on, but we played with bubbles, balls and her cars out in the garage which she loved. By now, when the timer would go off she knew it was potty party time and to headed to the toilet. She also knew once she sat on the toilet she would get to read a book, watch a video on my phone or sing a song – all which she was excited to do. By Saturday I was exhausted from staring at Lottie for two days and watching her every wiggle. Luckily dad was here to help take over and assist with the potty training duties. Again, shockingly, no accidents all day. We extended the timer once again to 1 hour and camped out in the playroom with all of the crayons and puzzles a kid could want. Saturday’s weather was beautiful so after her nap, and one more pee, we all went outside and played in the yard as a treat that she peed in the potty. Lottie loved the fresh air, and I was going stir crazy so glad to get out! The articles I read said to stay inside for 3 – 4 days and cancel all of your plans. We hadn’t had an accident all day and decided to break the rules and go visit grandparents for our annual St Patty’s Day dinner. We waited until she used the potty and then packed up and got in the car for the first time in 3 days! Our drive was short, less than 10 minutes, so we didnt have to go far for her first diaperless car outing. We of course pictured her peeing all over the car seat the moment we left the driveway. It didn’t happen. Once we arrived we tried to stay on schedule, but Josh and I started helping prepare dinner and Lottie started playing. She got excited being around all of her aunts and uncles, was in a new environment and didnt have us around to watch for her pee signs – so tonight we had a few accidents. Thankfully grandparents have raised 4 kids in that house and aren’t afraid of a little pee pee on the floor. By the end of the night we got a little bit better about using the potty, but she was still a little distracted with the excitement. She pooped in her underwear while we were there. We reminded her poop goes in the potty, walked her to the bathroom, dumped the poop in the potty and flushed it down. Again, no one freaked out when she told us she pooped or we had to scrape the poop out of her underwear. 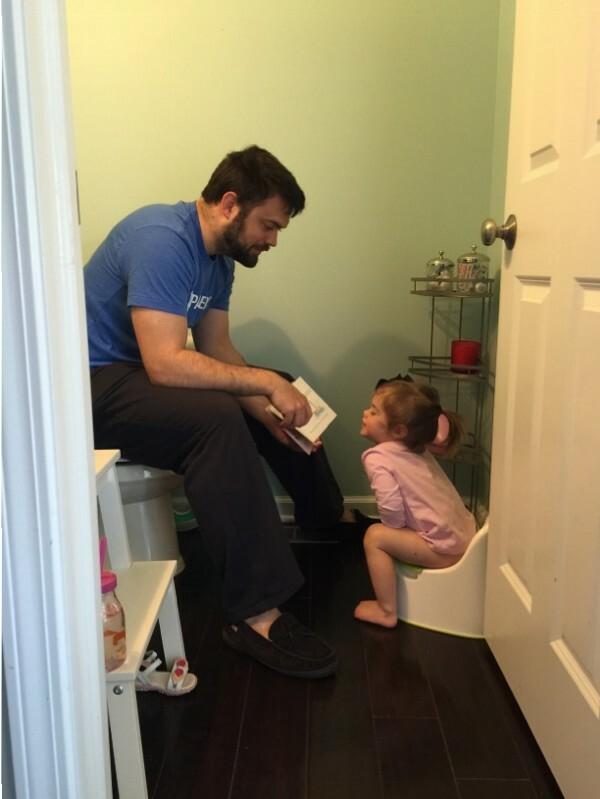 I don’t want her to be afraid to poop, but I do want her to understand that poop goes in the potty. The pooping in the potty will be interesting for us. Since we are still diapering at naps and nighttime, she knows that if she waits until one of these times she can happily poop in her diaper. Even though she hadn’t had an accident in 24 hours at our house, we came prepared with 3 – 4 pairs of underwear just in case, and we used all of them! On Day 4 we had our routine down. We took a risk and ventured further outside the house with a trip to Costco and Trader Joes. With a longer car ride and the two trips, we were planning on being out for a few hours. We were of course nervous, but confident at this point she understood pee goes in the potty and if we took her to the potty she would pee. So we waited until she peed and then packed up and left the house, giving us around 1 hour and 20 minutes until we needed to be near a potty. Our first stop was Trader Joes and by the time we had finished shopping our potty timer on our phone went off. Lottie hears the music and immediately announces “potty”, as her and I walk to the bathrooms in the back. She wasn’t happy about going to the potty this time. Maybe it was the public restroom, maybe the big toilet, new environment – who knows. It took awhile to get her on the potty, but eventually she sat on it and 5 minutes later said “all done”. She insisted she didn’t need to go to the bathroom and she made it clear she was ready to get out of the bathroom, so I praised her for sitting on the potty and left. We reset the potty clock for 45 minutes. We loaded in the car and headed home. Now that we were more confident she can hold it until our next potty time we didn’t have to hang as close to the toilet as we had the last few days. We spent time playing outside when we got back with a potty timer set for around 90 minutes. After 90 minutes we dragged her in kicking and screaming for potty time, she did not like the idea of stopping playing to go inside, but we want her to learn that she needs to take a break from playing and she can go back outside when she is done. She finally sat down, told us she didn’t need to go and she was all done and quickly ran back outside. By now it was lunchtime and dad and I were getting a little nervous. It’s like watching a ticking time bomb, at any minute she could go off and while we hadn’t had an accident all day, we still don’t trust her to tell us when she needs to go to the potty. While we counted down with the timer for another 60 minutes hoping she could hold on for the next potty party, she happily ate lunch and drank her milk. 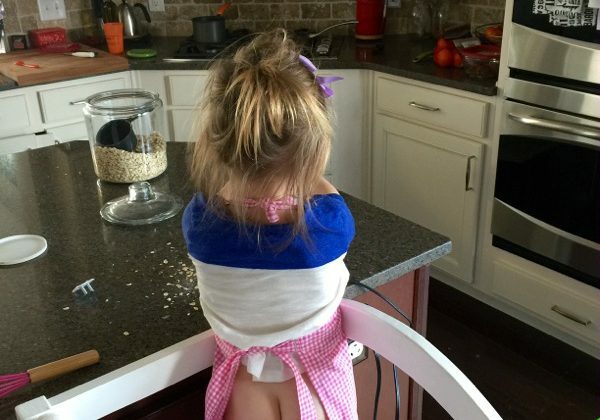 2 hours since her last potty trip at Costco the timer went off. We marched into the bathroom and like clockwork Lottie started peeing on the potty. 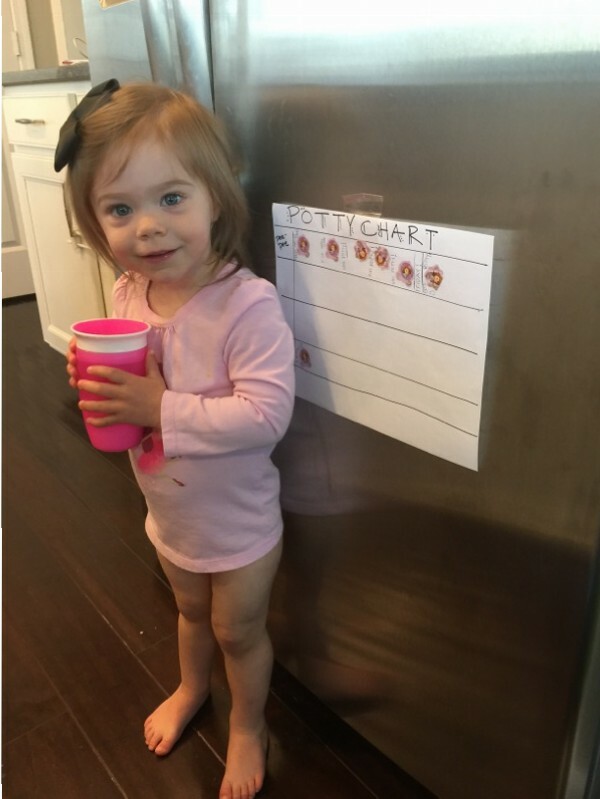 We did the potty dance, gave her a sticker to add to her chart and handed out a treat to celebrate. Kids are smart and learn quickly if you put in the time. After a week, I know we still have a way to go until we are completely potty trained, but we haven’t had a pee accident in 6 days and she finally today told us she needed to poop and actually pooped in the potty. The weekend was one of the best weekends Josh and I have had in a long time. We are always busy filling our schedules with house chores or events, but for this past weekend we cleared our schedule and planned to play. Literally we spent most of 4 days in one room entertaining ourselves. We had so much fun family time focused on playing instead of doing which was extremely refreshing after the last few months we’ve had! On a weekend that could have been a stressful weekend, we managed to go to sleep Sunday night refreshed and smiling about all of the fun we had. Like I mentioned in the beginning, I returned the potty training books I borrowed from the library, honestly I havent had time to read a book from front to back since Lottie was born so who am I thinking now is the time to sit and read. Instead I focused on articles online that I could read in shorter bits of time during the day. 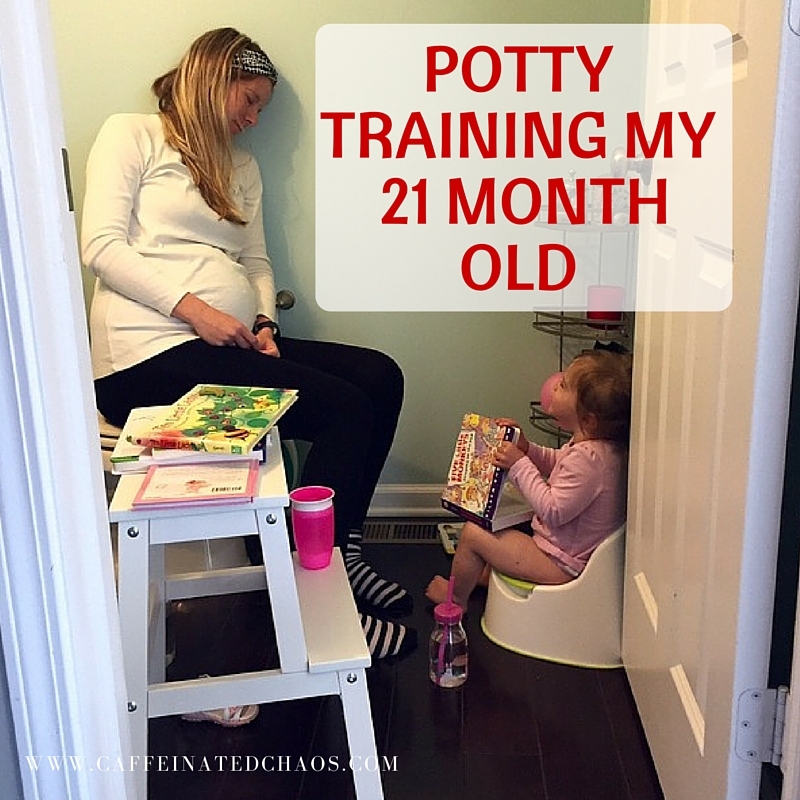 I took what I liked from each one and created my own potty party to train my 21 month year old that worked for us. Hopefully ours helps get you started, please email me with any questions or concerns! Thank you for this! We did day one today and over all went way better then I expected. My son is 21 months , and we also have a 3month old baby sister. He did say better then I expected him to we will try day to tomorrow. This was a very helpful read !